City of Kelowna grants height variance for 25-storey concrete condo tower in downtown Kelowna. KELOWNA, B.C. Today, Mission Group confirms that Brooklyn at Bernard Block has received its final council approval from the City of Kelowna and will begin public sales in mid-to-late September. Brooklyn will offer 178 new homes and will be a part of a master-planned development located on Bernard Avenue and St. Paul Street. 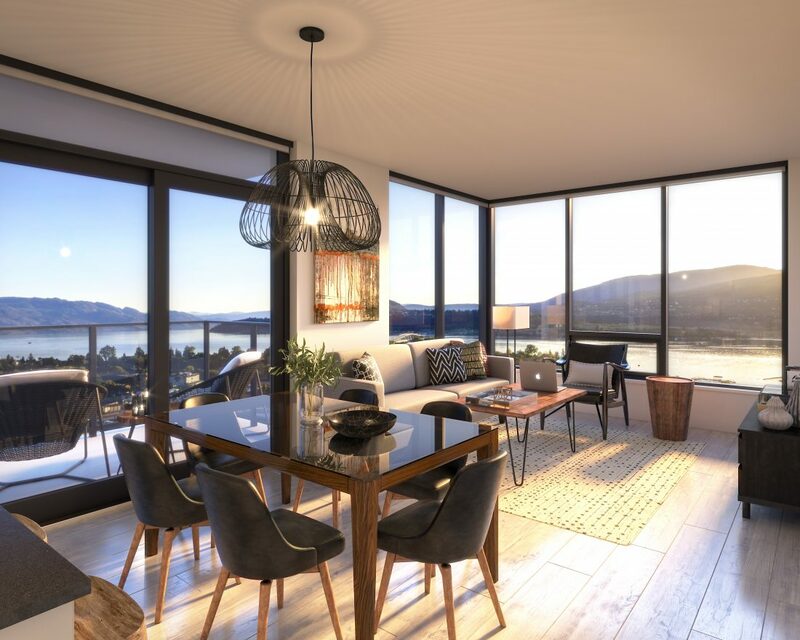 Brooklyn at Bernard Block celebrates community and social connection with an impressive 25-storey concrete condo tower featuring a rooftop terrace unrivaled in Kelowna. Located at 1471 St. Paul Street, just off Bernard Avenue, Brooklyn will be a part of a three-phase development plan that will include three condominium towers overlooking downtown Kelowna’s stunning landscape. “We are extremely proud of our Brooklyn at Bernard Block development and have worked tirelessly to create a community that offers modern city living with the perks of the Kelowna lifestyle,” says Randall Shier, president of Mission Group. The public sales release will offer competitive pricing starting in the mid $300s for one-bedroom suites. Also available for purchase will be one-bedrooms plus den, two-bedrooms and a limited collection of sub-penthouses. Mission Group has made sure to deliver a wide selection of home sizes at achievable price points for those looking for condominium ownership and an urban lifestyle. Each home has been meticulously planned and beautifully designed with the aim of creating open concept spaces that allow for flow and maximum use, along with mirroring the Kelowna landscape and lifestyle. Photo caption: Brooklyn at Bernard Block offers spectacular views (artist conception). Photo credit: supplied by Mission Group. For high res images see media contact. Brooklyn is in the heart of the Bernard District and literally steps away from Bernard Avenue, Kelowna’s main street. It is in close walking distance to a broad range of goods and services – giving the development an exceptionally high Walk Score® of 98 out of 100. Having undergone a $14 million revitalization, Bernard Avenue has transformed into a vibrant destination with trend-setting local cuisine, creative social houses, craft breweries, groceries, boutiques, art galleries, and museums. For more information on Brooklyn at Bernard Block, please visit www.liveatbrooklyn.com or to take a virtual tour through Brooklyn, click here. For the Brooklyn at Bernard Block Media Kit (backgrounders, fact sheet, and photos), click here.